As a western rider, you need to choose the type of western saddle that will allow you to ride the most comfortably and effectively when participating in your specific western riding discipline. Discipline-specific saddles are intended to give you a competitive edge while you are performing in equine performance events. According to the University of Georgia, reining is defined as an equestrian sport where the rider is supposed to control every movement the horse makes during the exhibition. Reining competitions involve the rider and horse completing predetermined patterns of movements, usually at a fairly high rate of speed. Reining horses are expected to be highly maneuverable and very athletic. Reining horses should be able to change speeds and directions quickly when cued by their riders to do so. Reining saddles are designed to give the riders of reining horses an advantage in the show arena by making it easier for the rider to stay in close contact with the horse. Reining saddles feature skirt and seat designs that are intended to promote maximum contact with the horse and minimal interference from the saddle. Reining saddles also feature low set horns and cantles to allow for maximum maneuverability, especially with the reins. 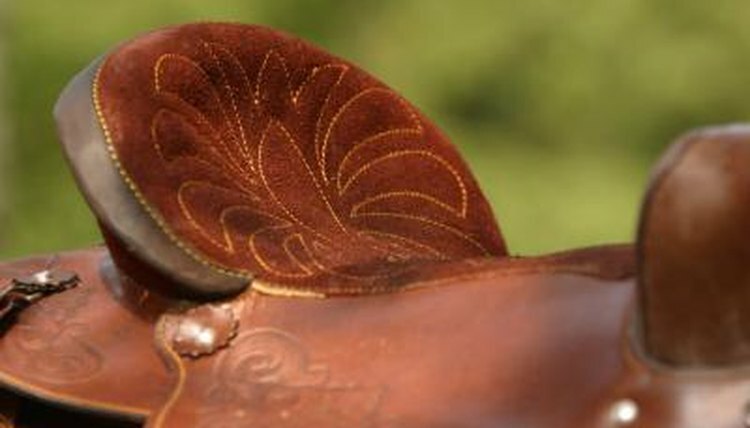 The cantle is the back of the seat of the saddle. Western pleasure is a popular riding discipline where horses are judged based on their ability to appear pleasurable to ride. Western pleasure horses move at very slow speeds and are supposed to give a smooth and comfortable ride that would be enjoyable even if you had to stay on the horse all day. The horse's knee action should be minimal, he should maintain a consistent speed regardless of his gait and his head and neck should be carried low. Western pleasure saddles are also known as equitation saddles or show saddles. These saddles are most easily identified by their show ring bling. Western pleasure saddles are heavily tooled and can be decorated with all kinds of conchos, patterns as well as various sparkles. The saddles feature a padded, comfortable seat that is designed to help push the rider into proper riding position as well as absorb some of the impact of the horse's gaits. They are designed to provide close contact between the horse and rider so that rider cues will not be visible to the judge. Western pleasure saddles typically feature a low horn, which designed to stay out of the way of the reins.